“Okay, campers, rise and shine, and don’t forget your booties ’cause it’s cooooold out there today. It’s coooold out there every day. What is this, Miami Beach? Not hardly. And you know, you can expect hazardous travel later today with that, you know, that, uh, that blizzard thing. Yessss, they are. But you know, there’s another reason why today is especially exciting. On their chapped lips, right: Do ya think Phil is gonna come out and see his shadow? The 1993 motion picture Groundhog Day is a favorite for my wife and I. We’ve seen the movie many times together, sometimes on repeated viewings even. We’ve visited Woodstock, Illinois, where the majority of the film was shot. I grew up in Pittsburgh, where even more of the film was shot. We’ve seen Stephen Tobolowsky live at Sketchfest and I even went to a book reading he did at Book Passage at the Ferry Building when his book The Dangerous Animals Club was released in 2012. This was the first time we got to see Groundhog Day in a theater on Groundhog Day and Stephen Tobolowsky did a special version of his podcast and Q&A as a part of the festivities. Our evening began with dinner at Taqueria Pancho Villa, which is right between 16th and Mission BART and the theater. We’d never eaten there before and the food wasn’t bad. I was impressed with their vast selection of aquas fresca and salsa. It was a bit disappointing that Groundhog Day on Groundhog Day was at such a small theater. The Roxie seats 238 and it wasn’t full for the show. We ran into the sound guy from Viracocha, who recognized us as the people who tape shows at Viracocha and was running sound for the event before we got seated. We’re notorious I suppose. Sketchfest co-founder Cole Stratton started out the show by running down a list of what remained in this last week of Sketchfest and introducing the deceased Stephen Tobolowsky, who was very much alive but Cole had been talking about Harold Ramis beforehand and slipped. Stephen said that it was probably the oddest introduction he had received that day and started into his live podcast recording, which was a discussion mostly about Groundhog Day, the film, which really has nothing to do with Groundhog Day the holiday but people have associated the repetition of the day in the film to conversation so that the film in a way has surpassed the holiday and taken on a different meaning. Groundhog Day was based on Groundhog Day only because Danny Rubin, the screenwriter, came up with the idea of a repeating holiday in late January and the next available holiday was Groundhog Day. Tobolowsky read for the role of Ned Ryerson with Harold Ramis, the director of the film, reading against him in the role of Phil Connors, which eventually went to Bill Murray. He was told by his agent he would be scheduled for a call back in a few days. Tobolowsky was in the midst of filming Calendar Girl, where he played “a bit of a mafioso” who had a deaf mute brother in the film. He and the actor playing his brother, Kurt Fuller, had to learn American Sign Language for their roles and he later went on to use that American Sign Language in later television and film guest spots including a role on Seinfeld. Trying to be polite, Tobolowsky said he didn’t really have anything in the works. Fuller responded that he had lined up a role through his friend Harold Ramis and that he would be playing Ned Ryerson, an insurance agent, in the film Groundhog Day. In the end, Tobolowsky got the part and they had to go back and do some reshoots for Calendar Girl. Acting with Fuller in those reshoots was very difficult because Fuller believed Tobolowsky had stolen his part in Groundhog Day from him. They made peace at the premiere of Groundhog Day in Los Angeles. C.O. Erickson caused another screwup as the unit production manager on Groundhog Day. He booked Tobolowsky to have a red-eye flight from the set of Calendar Girl to Woodstock, Illinois and then a 5AM call to shoot the next morning. Working on no sleep, with very little preparation, Tobolowsky met Bill Murray for the first time. Bill asked what Tobolowsky would be doing in the scene and Stephen did a bit of “BING!” and growling like Ned would later do in the film. Bill voiced his approval and Tobolowsky prepared for the scene. He was very tired and scared he would screw the whole film up, until he noticed a familiar face in the crowd who also noticed him and gave him a thumbs up. That friend’s thumbs up gave him the confidence he needed and he nailed the scene. The shooting for Groundhog Day was crazy. A few days into shooting a scene was shot where Bill Murray went crazy in his hotel room and used a chainsaw to cut away walls, shaved his head into a mohawk and destroyed the room. It was a very expensive scene, which Ramis eventually threw out and just had Murray break a pencil and set it on his alarm clock to replace it. They filmed five or more versions of each scene, as they hadn’t settled on what kind of day the repeating day would be. So they filmed snowy scenes, overcast scenes, sunny scenes, rainy scenes and gloomy scenes before ultimately settling on the gloomy day as the one they cut for the film. They only ended up using around 1/3 of the original script, with rewrites happening throughout the day each day of the shoot. Tobolowsky said the film made him not just “the bald guy” but “the bald guy from Groundhog Day” and introduced the movie. Watching Groundhog Day in a theater on Groundhog Day is highly entertaining and I recommend it if you ever get the chance. It is a very special film and watching it on the big screen, having visited the locations where it was shot, with one of the supporting cast members in the room was pretty magical. After the movie, Tobolowsky took the stage once more for audience Q&A. He revealed that Danny Rubin has recently been working on a Groundhog Day musical, Bill Murray’s character was meant to have relived Groundhog Day over and over for 10,000 years in keeping with Buddhist tradition that it would take 10,000 years for a human soul to become perfect. There were 38 versions of Murray’s day in the final film with Ned Ryerson appearing in 9 versions. Tobolowsky wrote the scene where Phil and Rita run into Ned at the VFW near the end of the scene and Ned has sold Phil a lot of insurance. He did this because Bill Murray was informed of the death of a close friend while filming and left Woodstock for several days. When Murray got back, they had very limited time to film at that location so they went with that scene as Murray had very little dialogue in it. In the final scene of the film, where Phil and Rita step out into the streets, it was supposed to be Phil opening the gate but it had been snowed in, so Murray made do and lifted MacDowell over the gate and then stepped over the gate himself. It ended up working beautifully and symbolically as Phil lifting Rita over a threshold and into the world. And yes, Stephen Tobolowsky has returned to Woodstock, Illinois. He has even christened the plaque that adorns Ned’s Corner. 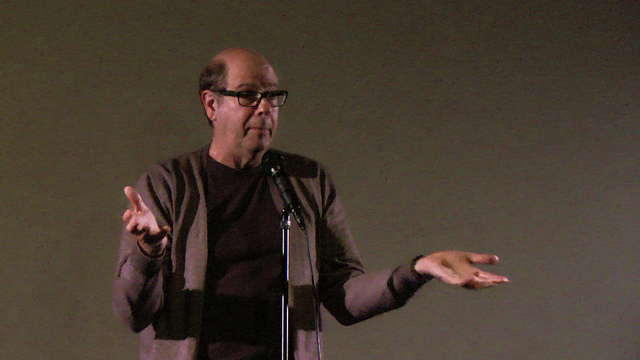 It was another great Sketchfest event and it is always a pleasure to hear Stephen Tobolowsky share stories. We visited C.R.E.A.M. across the street for dessert before heading home to six more weeks of winter.